Lotus Notes to MBOX converter tool helps to convert bulk emails data from NSF file to MBOX format. Without harming original formatting or metadata of files the tool converts multiple email which is accessible on more than 17+ email clients. The tool outputs single MBOX file for each NSF email in its original folder hierarchy. The tool provides customized option either to maintain folder hierarchy or save as per software algorithms and integrated with unique set of feature. During conversion of NSF to MBOX, the tool helps to maintain original formatting of NSF emails like To, Cc, email address, sent/receive date etc along with attachments. The tool does not make any changes to the integrity of files. 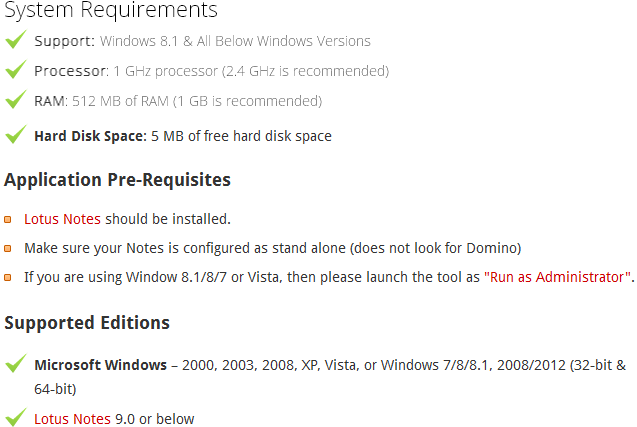 The tool supports all Lotus Notes version including 9.0 and below. Also the tool supports all Windows versions including latest Windows 8 and all below versions. Additionally, the output MBOX file can be accessed on multiple applications. 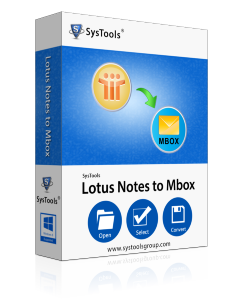 The software provides a small summary of Lotus Notes to MBOX conversion process to users with all details. Within tool panel, all details like current folder, number of emails converted, email count and name of migrate file are displayed for users. The tool is advance enough to provide option to save all output data at desirable location. Users can save all migrated files at location of their own choice by providing a destination location to software. All MBOX files will be saved to provided location. Export NSF file into MBOX file created using any Lotus Notes versions. Demo Version for quantifying the software efficiency or measuring the performance. You will convert NSF to MBOX upto 15 mails per folder. What is the size of NSF file that works with software to convert NSF as MBOX? You can convert emails from NSF file of any size using this tool, as there is no boundation over file size to work with tool. Can I run this tool on latest Windows 8.1 version? Yes, the tool is compatible to work on all latest Windows version including 8.1. How many files software support to convert at one time? You can create folder that contains NSF files and load it with tool to convert in MBOX format. Users can add multiple NSF files with tool to convert data as MBOX. Does software make any changes to formatting of emails during conversion process? No, integrated with latest set of features the tool does not make any changes to original formatting of files during NSF to MBOX conversion. I have need of only migrating selected emails from NSF file in MBOX format, I have contacted support department, and they have provided me guidance to invest in personal license of Lotus Notes to MBOX Converter tool. Once I invest in licensed version of tool it helped me to migrate only selected emails as per my choice. Thanks a lot guys! Lotus Notes to MBOX converter tool is superb tool that helped me to migrate NSF file emails as MBOX files in its original folder hierarchy. All emails are in its original format without any changes and alterations, keep it up guys!. I have only one word for tool which is excellent! It migrated all my emails from Lotus Notes NSF file to MBOX format along with email attachments in their original forms. Now I have separate email for each NSF email that I can easily import in plenty of supportive email client..